New World Events Added: Eruption, Winters Grasp, Blade Flurry and Black Plague! Improvement: Leaves on trees will now also spawn Ents! Bug Fix: Mob Event graphics should now always render correctly, other changes to the GL blending were being made by other rending such as enchanted items causing the graphics to display incorrectly. Bug Fix: Melee mobs are no longer able to attack when falling over dead! Bug Fix: The Darkness (Grue) Spawn Type should no longer trigger if the player's feet are inside a solid block. Bug Fix: Beholder Minions should now follow their masters correctly! ============================================================ Lycanites Mobs Update: The Cold Death - Version 1.10.8.1 for Minecraft 1.7.10 ============================================================ -------------------- Changes: -------------------- Configs older than 1.10.6.4 will be reset! 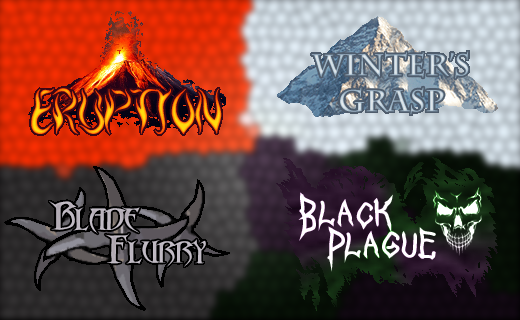 Update 1.10.8.1 New World Events Added: Eruption, Winters Grasp, Blade Flurry and Black Plague! Improvement: Leaves on trees will now also spawn Ents! Bug Fix: Mob Event graphics should now always render correctly, other changes to the GL blending were being made by other rending such as enchanted items causing the graphics to display incorrectly. Bug Fix: Melee mobs are no longer able to attack when falling over dead! Bug Fix: The Darkness (Grue) Spawn Type should no longer trigger if the player's feet are inside a solid block. Bug Fix: Beholder Minions should now follow their masters correctly! Update 1.10.8.0 New Arctic Mob Added: Serpix New Shadow Mob Added: Geist New Items Added: Blizzard Scepter/Charge, Geist Liver Improvement: Geonach are now natural Silverfish killers, as the defenders of the earth it is their duty to purge the Silverfish infestation! They will instantly kill active Silverfish on sight!